Canadian Omar Khadr, the youngest detainee at Guantanamo Bay, has pleaded guilty to all five terror charges against him at a war crimes tribunal. He has reached a plea agreement with US military authorities at Guantanamo. Khadr is accused of throwing a grenade that killed a US soldier during a raid on an al-Qaeda compound in Afghanistan. The 24-year-old, who had been facing a possible life sentence if convicted, was wounded and captured in Afghanistan in 2002 when he was 15. Khadr was charged at his war crimes tribunal with murder in violation of the laws of war, conspiracy, providing material assistance to a terrorist organisation and espionage. The defendant also admitted planting improvised explosive devices and receiving weapons training from al-Qaeda. Details of the plea deal have not yet been disclosed. It could potentially mean Khadr avoids life in prison, or see him returned to Canada to serve a shorter jail term. Seven US military officers will gather on Tuesday to hear testimony about Khadr's actions and impose a sentence. Khadr's lawyers told the court that the US had agreed to support Khadr's request to return to Canada after one year to serve the rest of his sentence, adding that his return would ultimately be left in the hands of the Canadian government. Procedurally, this is not a surprise. When the military judge ruled in August that a confession by Omar Khadr could be used against him, despite his claim that it was extracted under torture, everything pointed to defence lawyers seeking a plea agreement that would see Khadr transferred to his native Canada. Equally, the Obama administration would have been eager to avoid hosting the first war crimes trial since World War II of a defendant whose alleged crimes were committed as a juvenile. It would also have been the first contested trial at the deeply controversial Guantanamo Bay facility. If President Barack Obama wanted to argue that Guantanamo can deliver effective trials, it seems unlikely that he would have chosen this case. Of course, Mr Obama remains opposed on principle to the existence of Guantanamo Bay. But 10 months after the expiry of his own deadline for closing the facility, its continuing existence remains troublesome for his presidency. During the tribunal, the Toronto native was dressed in a dark suit and stared at the table in front of him while holding his head with his hands. He repeatedly answered "yes" to questions from the judge, who asked Khadr if he understood the charges against him. The judge then asked him if anyone had made promises to him so that he would plead guilty, to which Khadr responded "no". Khadr was accused of killing US Army Sgt Christopher Speer, from New Mexico, when US troops raided a military compound in Afghanistan in 2002. Khadr's lawyers have argued in the past that his family forced him into the war as a child. They have also portrayed him as a boy intimidated by "bad men" directing his actions. Khadr's trial began in August but was delayed when his lawyer fell ill. He grew up in Canada, Pakistan and Afghanistan and is the son of an al-Qaeda official who was killed in 2003. Khadr is the second person to plead guilty at a military tribunal and the fifth inmate convicted since the US started the tribunals after the 9/11 attacks. The US is the first country since World War II to prosecute a person at a war crimes tribunal for actions allegedly committed as a juvenile. 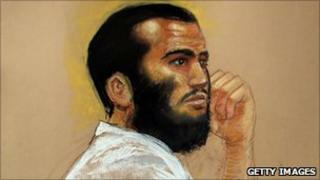 Critics of Guantanamo Bay have said Khadr should not be prosecuted because of his age at the time of the Afghanistan battle. US President Barack Obama has pledged to close the Guantanamo facility, but Congress has repeatedly blocked his efforts.